I took my first yoga class since the fall this week. I practice yoga everyday, but winter travel makes it difficult to attend an actual class. The class was blissful, but I was surprised to feel some soreness the next day. 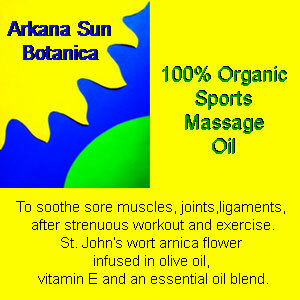 Fortunately, I had some Arkana Sun Botanica Sports Massage Oil to ease the strain. This massage oil has been designed to sooth muscles, joints and ligaments, especially after a strenuous workout and exercise. Contains organic ingredients of St. John’s wort and arnica flower infused in olive oil, vitamin E and an essential oil blend. This massage oil smells wonderful and offers instant relief. It is all natural and organic, so it is safe to use on the whole family (kids strain muscles too!). It works instantly, and I was surprised at how long the relief lasted, longer than most straight [amazon_link id=”B000OS131S” target=”_blank” ]arnica oils[/amazon_link] I have tried. One customer dubbed this product “Workout Wonder”! The sacred mystery of life expressed through nature. The light of the sun gives all things life. These herbal products have their beginnings in receiving sunlight. Christine is a massage therapist, in addition to an herbal healer. She treats my son with special needs through cranio-sacral work. She has healed me on many occasions when I have injured my back or my arthritic hip acts up. Christine has also made me a custom massage oil blend that I love the smell of as it lingers all day! Christine is a true healer, and I can’t wait to try other Arkana Sun Botanic products! Cloverleaf Farm has a wonderful salve made from wildcrafted St. John’s Wort at http://bit.ly/stjohnswortsalve. It’s actually red in color which shows that it really does have more of the healing herb than fillers.